Let Simply Delicious Catering take the stress out of your special celebrations and corporate events with our phenomenal catering services. Large or small, Simply Delicious is ready to embrace your vision for that next special occasion or corporate function. 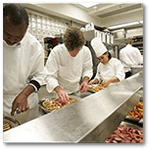 Our catering crew can design a diverse and compelling menu, including American and international cuisines. Recognized for our exceptional customer service and fine foods, we encourage you to explore our services and our extensive menus. Take a look at our current promotions and contact us to discuss your next planned event. With 26 years of combined catering experience, John and Richard Donato are leading professionals in the catering industry. Their vast knowledge and polished skills are the foundation for their Clifton Catering services. Consequently, this family-owned business has exceeded all expectations and now holds the distinction of one of Hudson County’s top catering businesses. 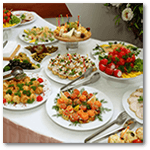 At Simply Delicious Catering, we believe each customer and occasion are equally important and endeavor to provide an extraordinary experience. Why Pick Simply Delicious For Your Clifton Catering? Whether entertaining business associates for a small luncheon or hosting a full-scale event, our Clifton Caterers promise to deliver a remarkable presentation. Our extensive menu selection and quality service, complemented by an impressive attention to detail, make us the right choice for your next business event or special occasion. Our professional experience includes New Jersey corporate catering, small and large parties, exclusive functions and more. We provide services throughout Clifton, Newark, and Jersey City areas. Our flexible schedule allows us to adequately meet your needs. Our event coordinators are ready and waiting to plan your event. Whether you are preparing for a brief meeting over lunch or an extended catered event, you can rest assured that each detail will be attended to. Our crew is an amazing group of people who fully understand the project complexities which need to be met in order to fulfill a vision. Couple this with premium ingredients gathered from local sources and outstanding customer service, and we know you’re in for a memorable experience. Designed with an employee-friendly environment in mind, our catering facility enables our staff to satisfactorily and efficiently manage client events. Simply Delicious Catering has ‘raised the bar’ for the catering industry, implementing unique approaches and quality service protocol. We’re making sure the quality of the food remains a top priority. Because food safety is so imperative to us, we precisely monitor and control temperatures for foods from start to finish, assuring the safe preparation of dishes, as well as preserving the flavor and quality. We believe a catering service should understand not only how to cook the food, but also how to transport the food and properly serve the food after arrival. For us, this begins in the kitchen from the very first minute. Our Clifton Catering team also excels in showcasing the exquisite colors and attributes of each dish, selecting complimentary accents and garnishes for a robust display. Our presentations are always appealing, consisting of fresh ingredients and savory spreads. We pride ourselves in our ability to harmonize your vision with practical elements to yield a successful and spectacular catered event. The Simply Delicious Catering staff is fully trained in serving customs and refined social behavior to ensure the highest reflection of sophistication. We believe our serving staff represents not only our company, but you as well. For this reason, we insist on a well-trained staff. 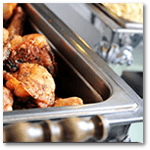 Simply Delicious’s Clifton catering Event Specialists are fundamental to the success of our events. Our specialists’ core objectives are to discern your vision and develop components to expedite a successful catered event. A trained Event Supervisor will be on-site throughout your event to coordinate the culinary team and provide an effortless affair. We work with you on all elements of your vision prior to and during your event to deliver an experience that is completely and singularly YOU.